My neighbor recently asked me how my vacation was going–the implication being that I get summers off. Oh, I wish. Summer is when I can crank out a bit more writing. It’s less stressful, surely, but not a vacation. My colleagues and I are putting some finishing touches now on a draft paper that looks at the issues in political ads. We know that super PACs and other interest groups are increasingly active in campaigns. But we know less about what they are saying, beyond attacking candidates they don’t like. Moreover, if one were to look at the issues mentioned in ads by outside groups and the candidates they support, is there any evidence that groups force candidates to discuss issues? Or is is the other way around? Complex stuff. 1. Imagine you paired up outside groups and their preferred candidates for a series of issues (e.g., Crossroads GPS and Mark Kirk on education policy). 2. Count the number of ads from each sponsor that references that issue in 3-day blocks. 3. Correlate issue mentions of the group and the candidate in the block and in previous 3-day blocks. What best correlates with issue mentions of the group and candidate in a 3-day time period? I do that in the graph below for Democratic and Republican cand/group pairs. What does the graph tell us? Well, most importantly, one’s own advertising in the previous few time blocks are most strongly related to issue mentions at any point. That effect starts to trail off pretty quickly (such that what you advertised on a month ago doesn’t tell you much about what you are doing now). That’s fairly predicable, but what’s interesting is the relatively weak correlations for allied ads (Crossroads ads correlated with Kirk’s, for example). There doesn’t appear to be any “issue leadership” from groups or candidates, though the correlations do trail off a bit, meaning there is some (small) effect in moving a candidate or group to advertise on certain issues. These are just correlations, but interesting ones; and the more fancy analysis in the paper seems to back this story up. All told, we need more work on what everyone is saying in their ads, not just whether it’s an attack or promotional ad. 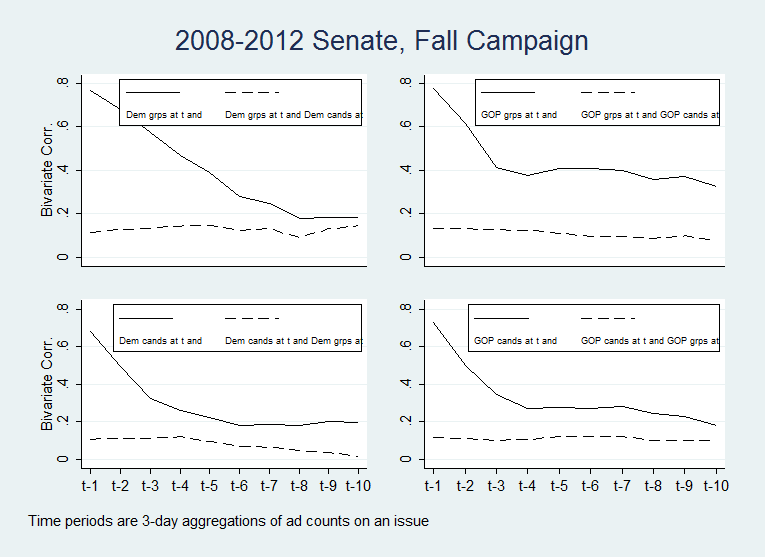 And this analysis suggests that there is not as much agenda hijacking from outside groups in Senate campaigns. What any political actor chooses to talk about in their ads is driven by other factors beyond what one’s allies are saying in their spots. Neat stuff, though we obviously need more work in this area.